The beautiful story of the Nativity is one that never ceases to inspire. 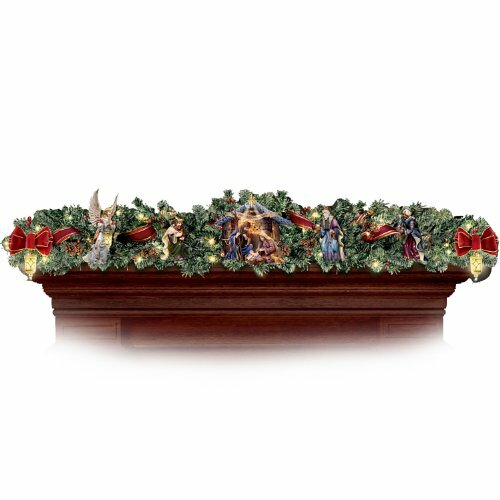 Now the passion of that very first Christmas comes to life like never before in the enchanting Thomas Kinkade Nativity Garland Set. Available only from the Bradford Exchange, Hawthorne Village Division, this Market First lighted garland set recreates the events of that special night through the glory of seven sculpted figures, including the Holy Family with illuminated Creche, Three Kings, angels and more.Expertly handcrafted with a wealth of intricate detail, this collectible Nativity garland set is a welcome addition to your Thomas Kinkade Christmas decor. Shimmering with the warm glow of over 60 holiday lights and the gleam of 22K-gold accents, this Nativity set makes quite an impression at a dramatic 4 feet long. Sure to add beauty and meaning to every Christmas season, this Thomas Kinkade Christmas decoration is not to be missed. Strong demand is expected, so order now!